PinkyPiggu: Napoleon Food & Wine Bar @ Telok Ayer Street ~ Enjoy Wine And Dine With Entertainer App's 1-For-1 Offer! Napoleon Food & Wine Bar @ Telok Ayer Street ~ Enjoy Wine And Dine With Entertainer App's 1-For-1 Offer! Napoleon Food & Wine Bar! An intimate 42-seater restaurant located along Telok Ayer Street (nearest mrt station DT18 Telok Ayer & EW15 Tanjong Pagar) that marries old world charm with cutting edge technology. We were greeted with nature-inspired theme deco with heavy emphasis on rock and wood upon entering the establishment. In the midst of the bar is also an eye-catching high-tech glass-encased wine display counter complete with automated dispensing abilities. Parisian owner Jean-Christophe Cadoret, having come from a family of wine makers in France, aims to provide wines of great quality and price points by specifically selecting wines from parcels adjacent to prestigious vineyards in France. Napoleon provides an extensive menu of not only wines, but modern European cuisine as well. For starters, the Homemade Foie Gras Terrine ($22) is classically executed with the pairing of foie gras and fruit chutney, balancing each out in acidity and richness. Hand-cut Agnus Beef Tartare ($30) may look intimidating especially for those not used to eating their beef raw, however surprisingly, the taste is relatively mild. The hand-cut texture ensures the beef is neither too tough nor fine, with enough bite and flavor in each mouthful. PinkyPiggu prefers her food to be cooked, and naturally, the Roasted Angus Beef Tenderloin ($32) resonated better with her tastebud. The beef itself was very pleasing, prepared to a succulent doneness that did justice to the cow that sacrificed its life for our dining table. It was served two ways, one with creamy gratin dauphinois, the other with appetizing ratatouille. We can't decide which was better. Both were equally good in their own ways. We continued the meal by moving on to some carbs. The Shrimps Truffle Angel Hair ($21) is served with finely chopped seaweed for an umami kick and the 75°C egg created a certain creaminess to the dish. Very well-flavored as a whole, but the angel hair's texture was a tad too soft. The pasta were also cut into shorter strands (perhaps because we were sharing the food) which imparted a less-than-satisfactory mouthfeel and diluted the overall enjoyment. Highlight of the meal was undoubtedly the Lobster Risotto ($36)! The risotto is cooked with quality acquarello rice to al-dente perfection and packed with robust essence of lobsters. Creamy and ooh so yummy! Desserts wise, the Duo of Chocolate ($15) has chocolate ganache and canele served with vanilla gelato and coffee crumble. Popping candy sprinkled around the desserts is creatively used to surprise diners. This chocolate delight is best shared amongst friends, and be rewarded with interesting reactions! Overall, Napoleon will likely please both food and wine lovers, especially the latter group with its wide selection of 32 exclusive French wines and highly customizable wine portions which allows diners to choose from tasting portions to full glass servings. Potential diners heading up to Napoleon Food & Wine Bar would want to take note of the current promotion tie up with the Entertainer Singapore app offering 1-for-1 for its main course. It is just one of the merchants offering 1,275 Buy One Get One Free offers for fine dining, modern & contemporary restaurants, cafés, nightspots, informal dining, attractions, leisure activities, spas, hotel accommodation and much more. From the 1st May to 31st August 2016, members can book one night, get one free; book two nights, get two free or even book three nights and get three free at more than 120 leading hotel partners. 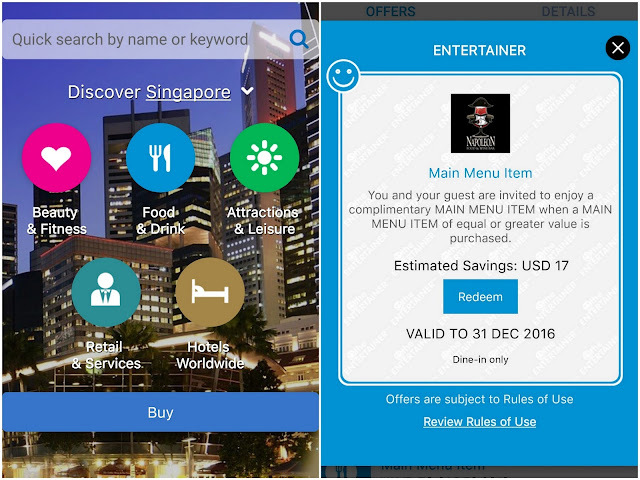 No question that the Entertainer Singapore app can help frequent users to save thousands of dollars in one calendar year.